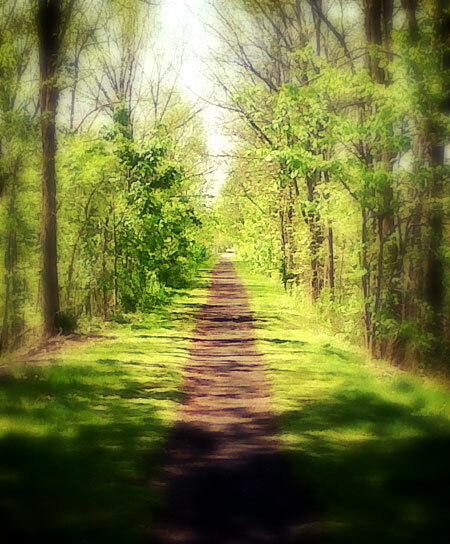 For me, the best part of spring is that I can start running on my trail again. In the winter, it gets covered over in snow, and then I am forced to run on the road, but as soon as everything melts, I am back on my trail, happy, surrounded by green and birds and shadows of leaves instead of shadows of branches, and chipmunks run across my path and I run and I run and sweat out all my frustration, all my troubles, all my winter angst, until I feel sunny again on the inside. And when my knees hurt, I am reminded of that saying “no pain, no gain,” and how it is somewhat inaccurate. Some kinds of pain require you to stop, because if you ignore them, there will never be any gain, there will just be more pain. And the key, the key, is to know how to tell which kind of pain it is that you are feeling. The kind that will pass through and become gain, or the kind that will just get worse and cause more pain. And I run and I run and I sweat out what might have been tears, let them flow through the river that is my body rather than down the forest of my face. And when I am done, when I have run through to the other side, things look better, greener, clearer. Yes, spring is surely daffodils and tulips, lilacs and bleeding hearts. But for me, just now, spring is motion, challenge, that one step at a time that takes me just a little closer to peace. I always get so restless when spring arrives. Sometimes the light is a bit too much. But often I just enjoy the sunny days filled with colors. beautiful shot, and I love the effects. For me, this is a picture of peace and tranquility.